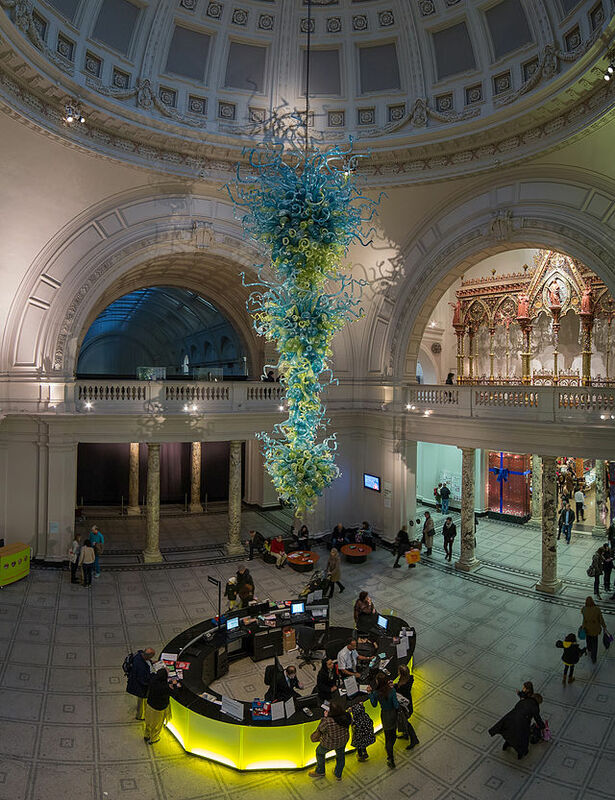 The collection of glass at the V&A is one of the finest and varied in the world. A must see. Horn, probably from Middelburg in the Netherlands or Antwerp in Belgium ), 1550-1600. 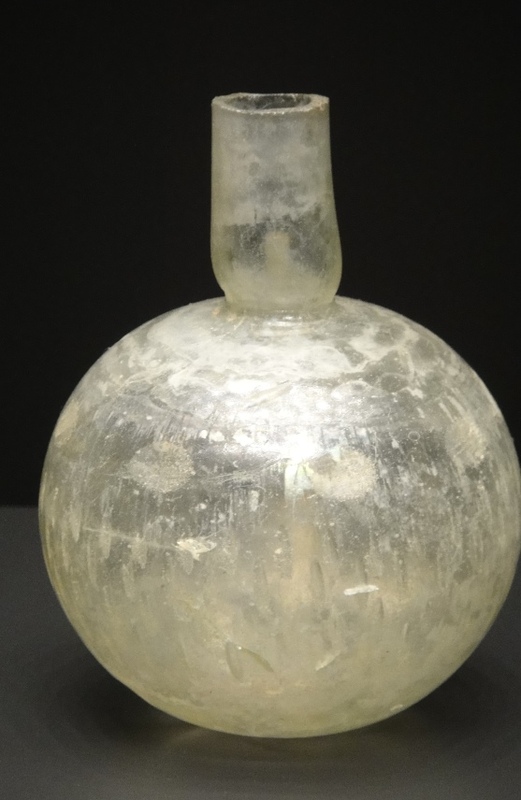 This is the glass study gallery for our main site Ancient Glass Blog of The Allaire Collection. 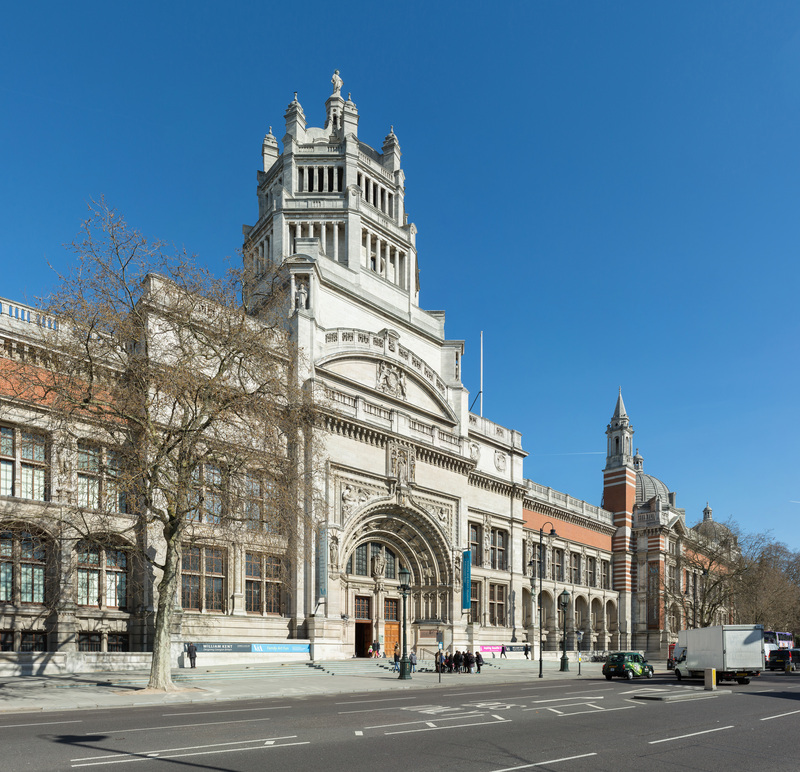 It is for people who are interested in going deeper into the study of the great collections of ancient and other antique glass found in museums. This study gallery is thumbnail photographs taken of glass on public view both in the USA and abroad. Click on the list of collections below to go to these pages. Date: of Islamic era, 9th.-10th. Century A.D. Technique: All four bottles cast as solid blocks of glass, drilled out, then cut with a grinding wheel and polished to form a container or unguentarium for precious perfume or scented oil. Description: Four bottles of light green glass, that all have square, four sided bodies with hexagonal necks, three of them with four tapering or pyramid-shaped feet at each corner. Decorations on neck and bodies, each with different triangle- and square formed plastic elements, created with a grinding wheel. Glasses a, b and d have tapering necks from the rim towards the body. All four rims are plain. Condition: In fairly good condition, but weathered, glasses b and d bear heavy, colorfull iridescence; unguentarium c has lost its feet all together. 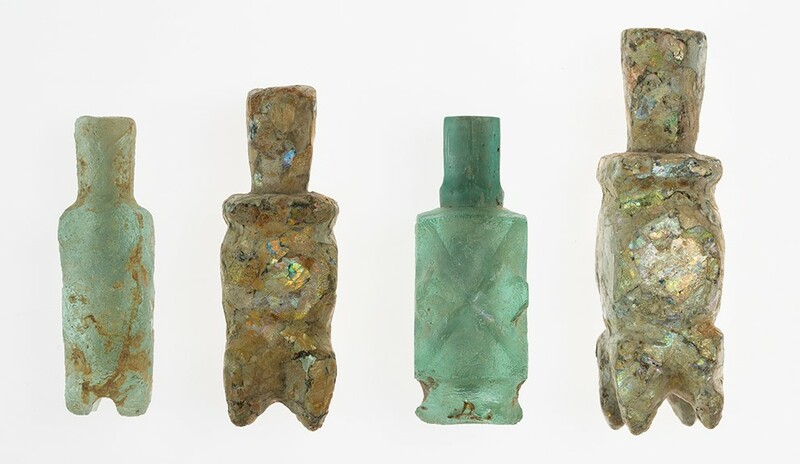 Remarks: Two of the small bottles were carved from green glass, the other two possibly also; cut in a popular shape for cosmetic containers used in medieval Egypt, commonly in modern times referred to as ‘molar flasks’, for the vessels shape is thought to resemble a tooth. The four feet function as a pedestal to the flasks, that could have contained cosmetic unguent and perfume or possibly kohl for eyelining. S. Auth remarks about the example in the Newark Museum (50.1814), that ‘from their shape, they were probably made as imitations of rock crystal’. The pale green colour of two of the four presented in the Augustinus collection, do resemble crystal indeed or at least chiselled translucent rockstone. * C.J. 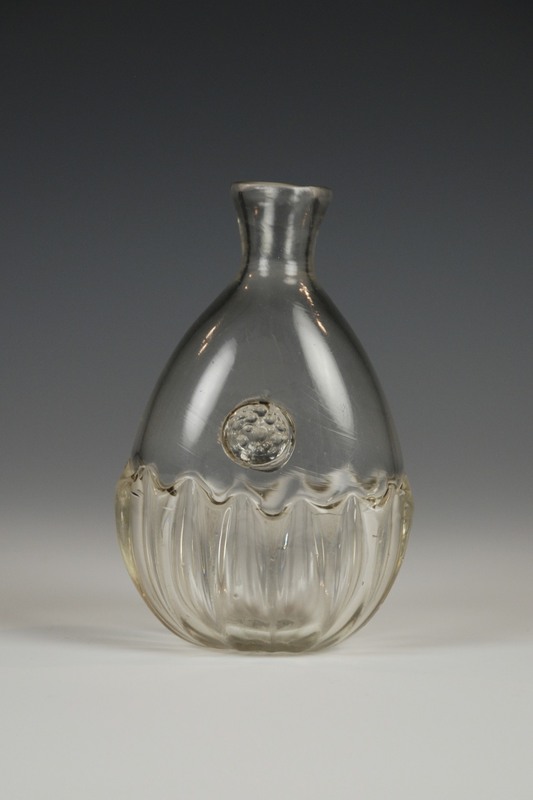 Lamm describes in his Glass from Iran (1929/1930/1935), that the ‘molar flasks’ were produced in Egypt because of Egypts renown skills for cutting crystal rock. S. Auth and D. Whitehouse think this idea to be doubtfull, because most of the examples brought to light come from places spread throughout medieval Persia, several from a period of time earlier than the 9th. century A.D.
Provenance: From a private dutch collection; previously unpublished. Reference: Kelsey Museum of Archeology, 1968.2.13; Corning Museum of Glass: Glass of the Sultans, gift of the Fustat Expedition no: 69.1.42.; Kerstner-Museum Hannover, 1982, no: 156; Fremersdorf, cat. of the Vatikan, no: 912f; La Baume, coll. Loeffler no: 2015. Literature: C.J.Lamm, Glass from Iran, 1935; Carboni and Whitehouse, Glass of the Sultans , 2001; Fustat Glass of the Early Islamic Period, 2001; Islamic Glass in the Corning Museum of Glass. Vol. 1, 2010. IS THE GLASS VESSEL A BEAKER, BOTTLE, BOWL, FLASK, OR CUP ? A universally accepted terminology of ancient glass shapes does not exist. So wrote E. Marianne Stern in the book Roman, Byzantine, and Early Medieval Glass, Ernesto Wolf Collection 10 BCE-700 CE, publishers Hatje Cantz, 2001. The rest of this post is based on this book and Stern’s writing. In the following post of terminology, Greek and Latin names are used sparingly. Where possible, an English name is preferred and the terminology is followed by a picture or pictures illustrating the term. Amphora: A special form of jug with two handles. Aryballos: A bath bottle for cleansing oil. 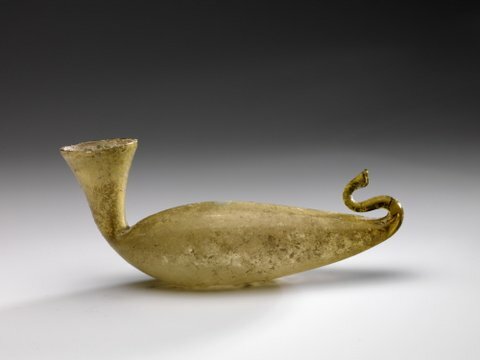 Askos: A vessel imitating the shape of a wine-skin. Beaker: An open-shaped vessel that is taller than it is wide. Usually, but not always a drinking vessel. Bottle: A sizable vessel with a neck, with or without handles. The mouth is usually made so it can be closed tightly. The body can be barrel-shaped, cylindrical, spherical, square, or prismatic. Usually for storage and transport; sometimes for serving liquids at the table. Special shapes are, Frontinus bottle, Lenticular bottle, Spouted bottle. Small bottles are called unguentaria. Bowl: An open-shaped vessel that is wider than it is tall. Usually for serving or presenting food, sometimes for drinking; in the East also for lighting. Special shapes include Zarte Rippenschale. Cone: An open conical vessel ending in a point. Usually used in the West for drinking and in the East for lighting. Cup: An open-shaped vessel that is about as tall as it is wide. Usually for drinking, but sometimes lidded and used as a jar. Special shapes include goblet, Hofheium cup, modiolus. Dish: A flat or shallow bowl. Usually for serving or presenting food. Flask: A vessel with a neck but without handles. The mouth is usually not made for closing. The body is usually bulbous. Usually tableware, for serving liquids. Goblet: A stemmed, footed cup. Usually used for drinking. In Eastern Mediterranean commonly used as an oil lamp with a floating wick. Jar: Two types of jars 1 and 2. (1) A vessel with a wide rim but without neck. The body can be bulbous or square. Usually for storage of foods. Special shapes include: urn. (2) The commonest form of the Eastern Mediterranean jar has a funnel neck which is actually a tall, flaring mouth. The body is usually bulbous, less frequently cylindrical: it can have functional handles, multiple decorative handles or a pattern trailing attached to the rim. These jars were probably tableware for serving foods. Jug: An elaborate flask usually with handle. The mouth can be round, trefoil or spouted. Usually for serving wine or other liquids at the table. Special shapes include: amphora see top of this page. Kohl tube: A tubular container for kohl, a black eye paint used widely in Egypt, Syria, and Palestine. Lenticular bottle: A bottle with flattened section. Urn: A burial jar for cremation ashes which may be lidded. The body is usually bulbous. Many burial urns have two heavy coil handles, often M-shaped. Description: A large flask in a bluish pale color has a globular body with a flattened base. The straight cylindrical neck ends with a small outward-folded collar rim. The body is decorated with five wheel-cut bands of alternating widths. A thin layer of iridescence is scattered over the piece. A tiny strain crack appears inside the neck, otherwise it is intact. The bottle is from Italy. Ref: Scatozza Horicht 1986, pp. 56-57, nos. 125-126, from Herculaneum, not later than A.D 79, Hayes 1975, p. 58, no. 144 published a similar bottle of unknown provenance and noted a parallel from a Neronian or Vespasianic grave at Histria Alexandrescu 1966, p. 219, pl. 101. Constable-Maxwell Collection 1979, p. 77, no. 125 may belong to this group, although it was catalogued with a later date. Comment: The flask belongs to a group of globular bottles with cylindrical necks and plain or collar like rims, which are decorated with parallel and / or intersection circles or combinations of circles and other motifs. The size varies. The bottles may be divided into at least three subgroups. Vessels in the first subgroup have collar like rims and decorated on the wall with continuous broad, horizontal wheel-cut bands; they were present in Italy in the first century A.D. example Allaire Collection 10R above. #433 Bottle The Corning Museum of Glass 3-4th C.
Wheel cut bottle in The J. Paul Getty Museum (Getty Villa) 3-4th C.
Description: Translucent white to yellow-green, rather thin, glass, weathered and with golden irisation on the inside and outside, sand encrusted; two wheel-engraved lines, one at 0.41 cm from the mouth, second one at 3.44 cm from below; bottom indented to create a standing ring; with traces of a possible pontil mark. Condition: Delivered in complete and uncleaned condition, with no cracks, but sand encrusted and with a very fine layer of a golden irisation allover. 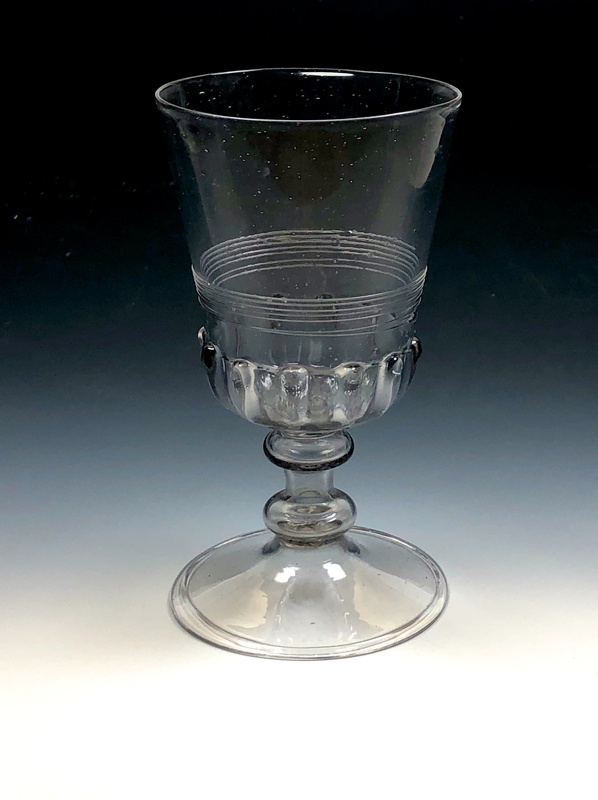 Remarks: A close parallel is a beaker from the collection of Louis Gabriel Bellon (1819-1899) inventory number 575*, height 8 cm, with a similar shape and mouth, also translucent in color and with wheel-engraved lines. Fremersdorf presents in Die Farblose Glaeser der Fruehzeit in Koeln (1957) a beaker with a height of 12,5 cm and a diameter at the mouth of 11,8 cm, wheel cut lines and a form of shape of the cup ending almost straight at the mouth, as is the case with the example in the Augustinus collection. 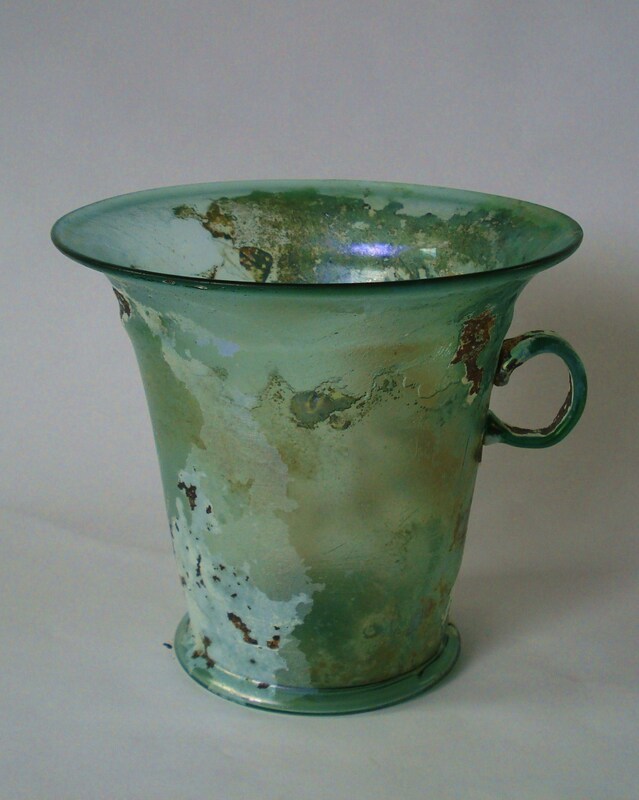 Susan H. Auth states in Ancient Glass at the Newark Museum about a colorless – blue green cup, (50.1873) of the 3rd. 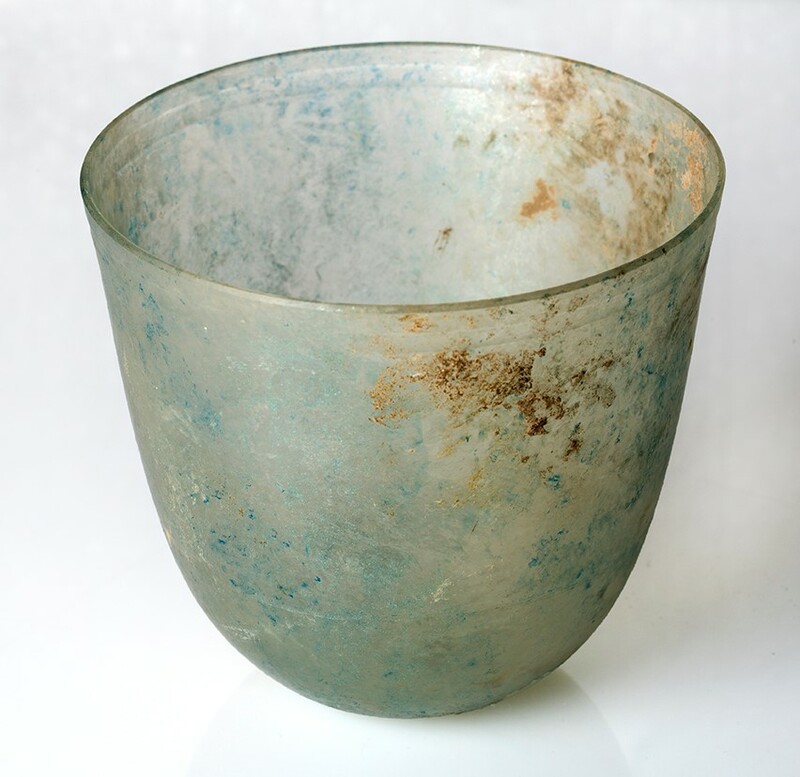 century and found in Cologne: ‘probably the simplest shape of drinking vessel with flattened base and knocked off rim, that could have been quickly produced by Roman glass shops’. However she does not mention the possibility of blowing the beakers into a mold. Isings describes in Roman Glass from dated finds (1957) similar cups from the third century, but with slightly outsplayed rim, as does the french writer Sennequier in Verreries Antiques, where profile drawings of the cups and beakers of the Gallo-Roman era do variate at the mouth from widely outsplayed to almost straight. Reference: *Collection of L.G. Bellon, sale-catalogue 2009, no 205. Kisa, slight variation in form to no: 380; Fremersdorf, 1957, vol. XIX, p. 7, inv. No 6004; Isings variation to form: 29, 3rd. c. A.D.; Auth, 1976, Ancient Glass at the Newark Museum nr. 50.1873 Goethert-Polaschek, 1977, 72, nr 302, Taf. 42; Sennequier, Verreries Antiques, no 298, p 110-112. 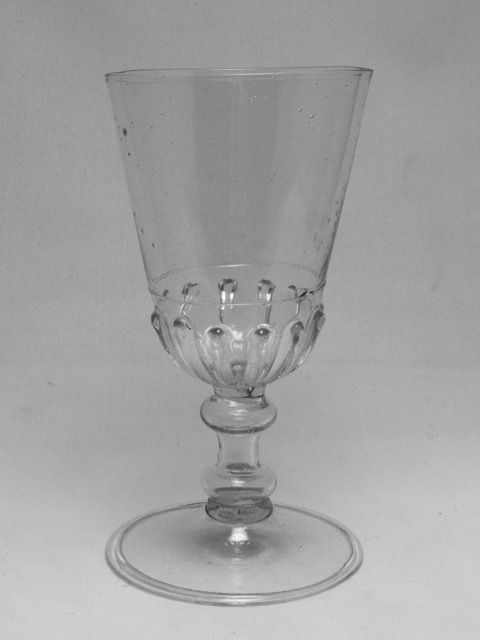 Description:The glass has a bucket bowl with rounded base with gadrooning (messa stampaura) of twelve ribs. Around the bowl a colorless thread is wound seven times. The hollow stem consists of two hollow knops with a straight part in between called a spool stem. Conical foot with folded rim. Parallels: Fragili Trasparenze: Vetri Antichi in Toscana, Anna Laghi 1990, P. 4, 51 (plain bowl), Elisabeth & Theo Zandbergen glass collection, Example 20 seen below. 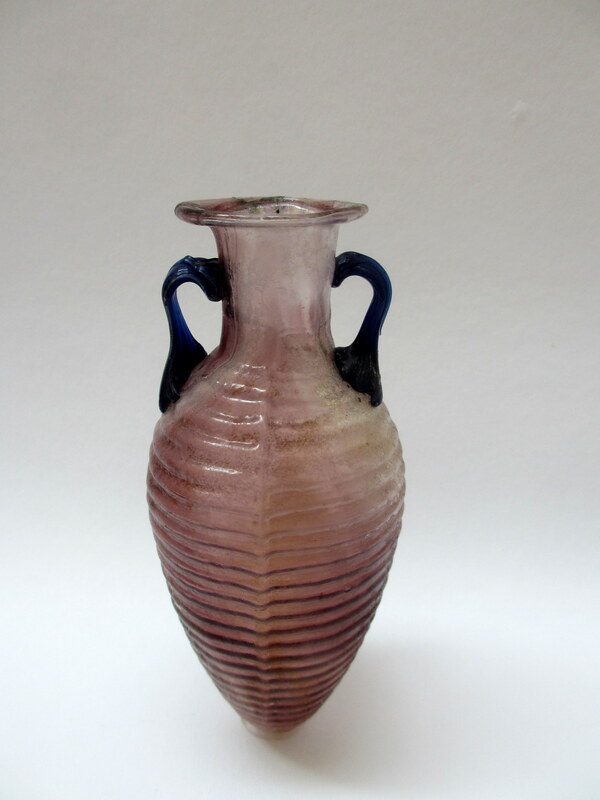 Glassmakers during the Roman period had an impressive array of colors to use to make their glass vessels. Describing these colors can be difficult. Colors of glass can appear as different shades depending on the surrounding light, shape, thickness, chemical composition and opacity of the glass vessel. 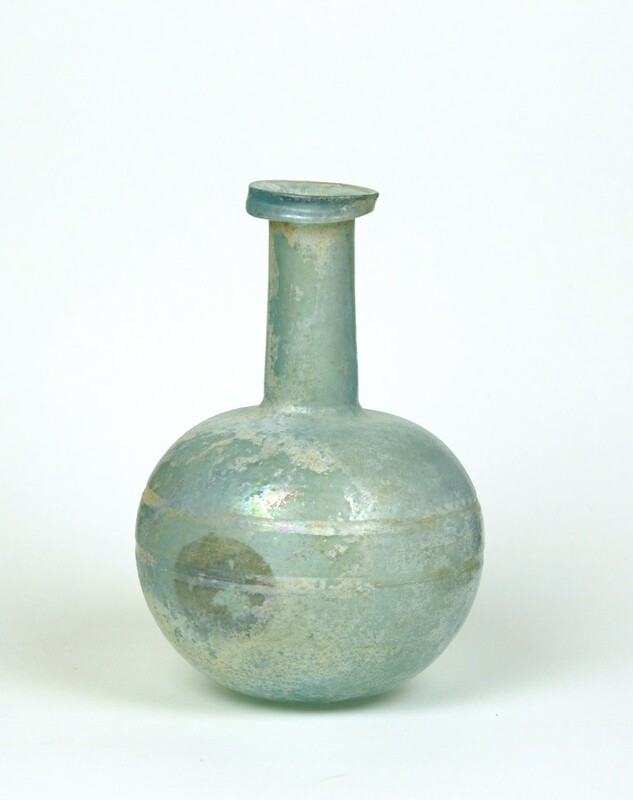 The glass made in Roman times had naturally occurring metal ions giving the vessel a greenish, straw or brownish color depending on the source of the raw materials. However, the glassmakers knew how to decolorize the glass or add other metal oxide to make all of the colors found in Roman vessels. 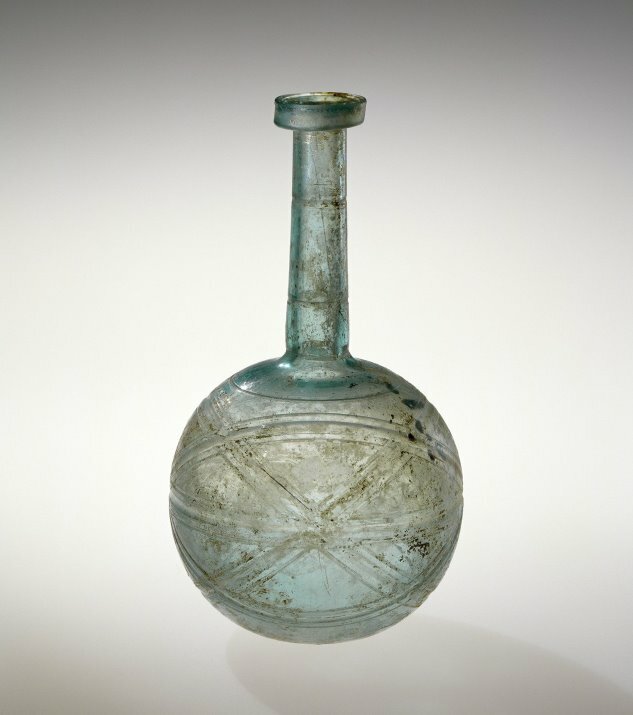 As styles and taste changed over the centuries during the Roman Empire so did the general color of their glass. These color changes give some indication of when these glasses were made and where. These patterns are vague with many exceptions. Colors used to make Roman glass are Brown, Aqua (bluish-green), Amber, Aubergene, Blue, Green, Yellow, Straw, Olive green, Red, Black, White and Colorless. Also, with each color the modifier such as pale or dark is used to describe shade of color. 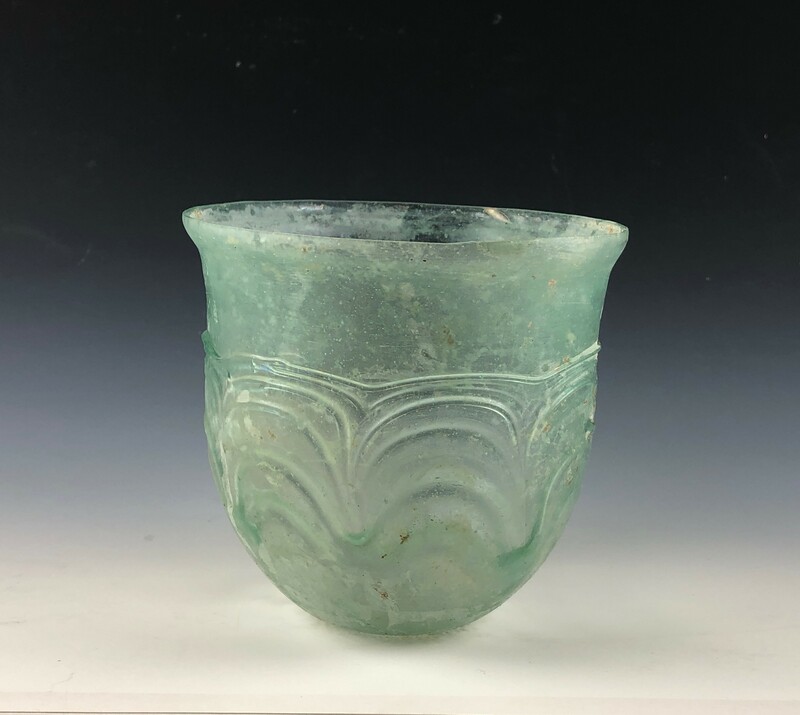 Description: Deep bluish-green glass beaker was shaped by blowing into an open mold. The decoration features self-trails applied and tooled into a festoon pattern, a common design used on glass vessels of the Migration Period. At the rim a slight flare is present with a cracked-off edge. Intact, some weathering.